Everyone loves Bbq Pork Ribs, sweet, smokey, sticky and full of flavour. The process of making ribs is just as important as the barbecue sauce you use. This fast ribs recipe is a time saver, tender and full of flavor. How to make BBQ Ribs fast! 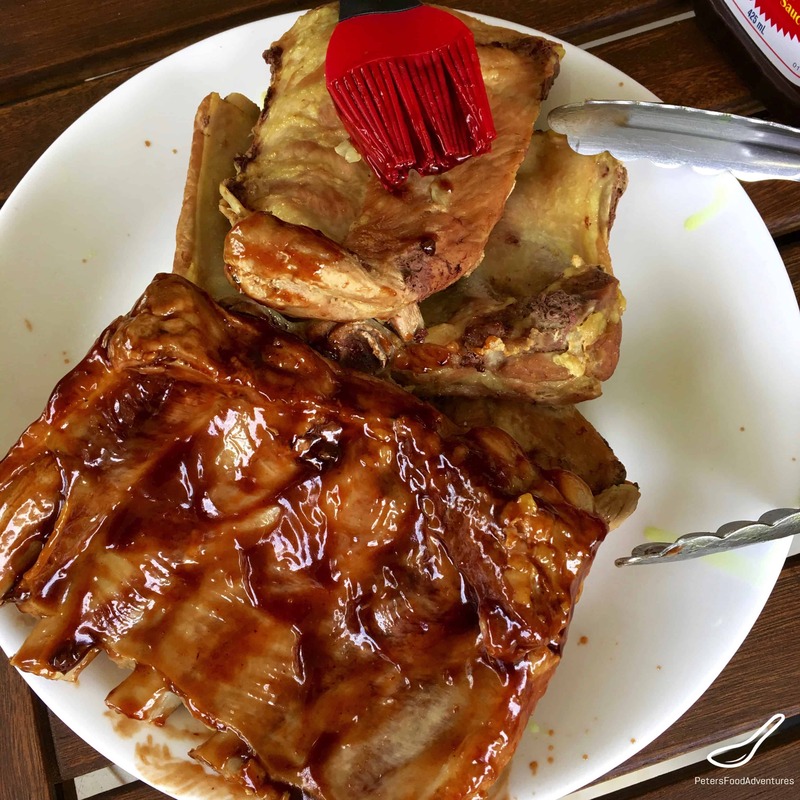 Some Bbq Pork Ribs recipes use dry rubs, some marinate for hours, some slow cook, some bake and others grill. So many methods, so little time! Time is something we are all short of. My recipe makes boiled ribs in a stock then grills on the barbecue. This speeds up the cooking process, still allowing the ribs to be tender. This is the fastest way to make ribs, ensuring they’re still tender. Check out my Fall of the Bone Ribs in Oven recipe for a different way to prepare ribs. I think there are 2 nations that are famous for their bbq ribs. South Africa and the USA. No one else comes close to how delicious their rib recipes are. South Africans love their Braai (bbq) and have developed their own bbq sauces, different from the American style. Sometimes I make a South African Monkey Gland Bbq Sauce which I serve with my ribs. It’s worth checking out. Americans are famous for their smokey barbecue sauces, rib cook offs and secret recipes. Sometimes I make my own barbecue sauce, but my favourite is Sweet Baby Ray’s Barbecue Sauce. They make many varieties of flavours, from sweet to spicy. They do the hard work in making a great bbq sauce, so I don’t have to! The perfect accompaniment to bbq ribs. 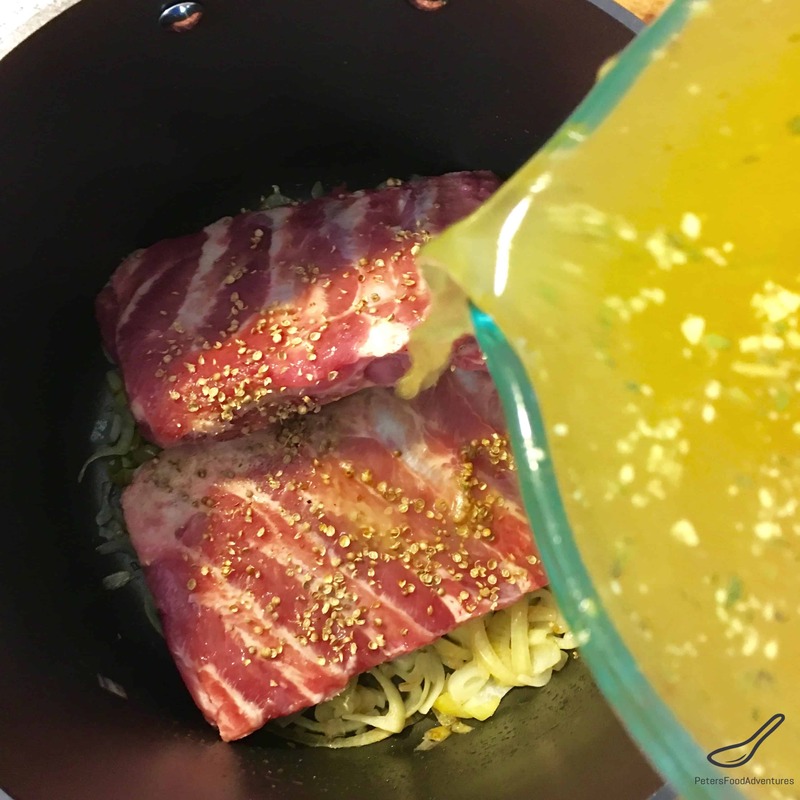 Instead of boiling ribs in plain water, it’s better to make boiled ribs in chicken stock and onions, so the flavour permeates through the meat. I sauté the onions and garlic, add crushed coriander seeds, and enough chicken stock to cover the ribs. Some people add beer or other spice flavors, your choice! Remember pork is a white meat, which is why chicken stock works well. It’s an easy step that adds extra flavor. These fast Grilled Bbq Pork Ribs are an easy recipe to make, with great wow factor. Use a great barbecue sauce, and you can’t go wrong. Finger licking goodness. Bon Appetit! Приятного аппетита! Great recipe for a cold winter weekend! Thanks for checking it out! Love a good ribs recipe! ???? Mouthwatering for this carnivore…. Jealous – you head towards the summer and we, winter…. Yes indeed. It’s been a long horrible winter. Bring on the summer recipes!!!! ??? ?